No. 26, Lane 57, Dazhi St. If you live in Taipei long enough, one of things you start craving (besides Mexican food) is a hearty American breakfast. After awhile, even the thought of IHOP or Denny's sounds good, where you can get breakfast for dinner, lunch or breakfast. So where to look if you're too lazy to make your own pancakes, french toast or eggs? 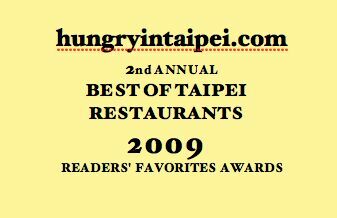 You can try hitting up the various hotels in Taipei, like I did once with my cousin on the prowl for a good waffle in Taipei, but that can be pricey and their window for breakfast stop once the clock hits a certain time. Those that have shared that craving with me have probably heard of the Diner- one of the most popular breakfast places in town to get your omelettes, pancakes and American style breakfast everyday, all day. Or there are a number of other players in town including Posh, NY Bagel, Hsiang Brunch, Good Day, Swensens. The biggest piece of evidence is the menu and the execution of the dishes- one glance at the menu and Diner fans will probably be feeling dejavu- items are pretty much in the same order and style as the Diner, with pancakes, french toast, breakfast burritos, eggs benedict, omelettes, hamburgers and menu items like meatloaf, country fried steak, pasta and lasagna. But perhaps the fact that the Door is just like the Diner is good thing for the residents in Dazhi- they'll have a breakfast place to patron without having to leave the neighborhood. The Asparagus and Chicken omelette was fluffy and stuffed with diced chicken, asparagus and melted cheese, but the potatoes o'brien were a bit soggy. I'd also recommend the plain pancakes plate over the blueberry pancakes as there were so many blueberries in the pancakes, it was a bit overkill. They were also canned blueberries, so it wasn't as fresh tasting as it could have been. But the regular pancakes were perfectly fluffy and soft, best eaten hot. I actually wanted to try the burger and so I got a Swiss and Mushroom hamburger which I did enjoy. It had a thick patty and plenty of cheese and sliced mushrooms. The meat to bun proportion was good and the bun tasted like an American bun should, not sweet like some Taiwanese buns. The Door doesn't take reservations, but we were able to snag a table for 6 without a wait before noon on a Saturday, but I can't promise you won't have a wait! It might be a bit tricky to find or park, so take a look at a map before you head over. Anyone who has wandered into a 7-11 in Taipei was probably immediately dazzled by the array of drinks, snacks, bentos, tea eggs and buns. Not to mention the coffee and Icee machines. 7-11 should just be called snack heaven. I have yet to try their thousand year old egg with congee or braised pork bentos, but their rice triangles are pretty decent in a pinch. The way they wrap it separates the seaweed from the rice and keeps it crispy until you wrap it yourself. Instant noodles that come in their own styrofoam bowls- a starving student's dream selection. Sometimes they have sticker promotions where you get a sticker for spending a certain amount (usually around NT$70) by a certain time and then if you collect enough stickers you can get a prize or coupon for free Coldstones or something like that. If I ever run out of restaurants to eat at, I'll start a 7-11 Taipei Snack Heaven blog and feature an item a day. That would be hilarious. After passing by this bakery so many times near the Shida night market (on the way to Yofroyo), I finally got a chance to try it. Windows full of breads and cakes, my first pick was my favorite- a huge bun swirled with sticky brown sugar. Slightly crispy on the outside, tear apart soft on the inside, the swirled brown sugar is almost gummy, like thin mochi. You must eat the breads the same day, since they never seem as good the next morning. I also preferred the oversized bread to the brown sugar croissants, which didn't have the same gooey texture inside. I didn't get a chance to try any of the cakes or desserts, but I'll be back! With all the Western restaurants in town, it really is hard to figure out which ones are good and which ones aren't unless you actually sit down and have a meal there. Some are local restaurants masquerading as Western fare and some are Western chains that have menus identical to their counterparts on the other side of the world. But more and more, there are quite a few little spots that surprise me, that can deliver a table full of solidly good and interesting food. My aunt picked WeiB for a Sunday brunch with my parents before my dad was headed back to LA. It was fairly empty when we got there, though it is quite spacious with different seating areas. The decor is clean, but elegant- the kind of place that is perfect for meeting your relatives for brunch. Their website notes that the name of the restaurant is ""WeiB" (pronounced weiss) is German for white, and an expression of a unique German restaurant and wine bar featuring German white wines. The owner fell in love with the richness of German white wines after visiting a winery there and wanted to bring them to Taiwan. The brunch menu was more lunch than breakfast, ranging from NT$280 to NT$650 for the prime steak reuben sandwich. I ordered the lone breakfast item- the Smoked Pork Loin with Honey Clove and Eggs Benedict in Horseradish Sour Cream (NT$380). I joined them a little late, so they had already ordered all their food. But it made it perfect for tasting before my food came. All the pasta was al dente and the meats were perfectly seasoned and grilled. WeiB specializes in gourmet Western and German food, so their brunch menu also included Crispy Pork Knuckle (NT$360) and Roasted USDA Prime Rib Eye (NT$600). My mom really liked her Focaccia Sandwich with Seasoned King Oyster Mushrooms, and she could only finish half the sandwich. Being vegetarian, she doesn't usually have a lot of options and has had her share of grilled portobello sandwiches, so this was a welcome variation for her. I think they were out of focaccia that day, as the sandwich came with rye bread instead. The Pumpkin Risotto with Shrimp and Pistachio (NT$360) was creamy and rich, and I wanted to have more than my sample bite. While I was waiting for my food, they brought over the brunch appetizers- a few veggie sticks and your choice of orange juice or milk. Not too long afterwards, my plate came. I was a little disappointed to see only one egg when usually eggs benedict come in a pair, and underneath the egg benedict was a toast cut in a shape of a circle rather than an English muffin. But the crisp roasted potatoes and candied orange slice made up for it. Luckily, I had eaten a bit off everyone else's plates. Their lunch and dinner menu includes a range of appetizers, salads, soups, grilled meats, seafood, pastas/rice and desserts in the NT$180-NT$900 range, with combo sets available from NT$1380 up. If I ate there again, I think I'd like to also try some of their house Rieslings, as it's a sweeter white wine. There will be quite a few more brunch and breakfast places in my upcoming posts, both Western and Chinese, so be sure to let me know which ones are your favorites.